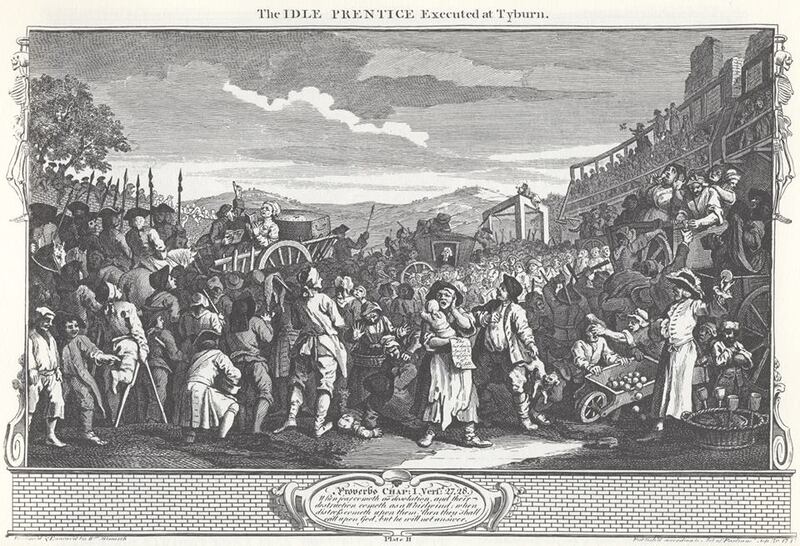 The Idle Prentice – Executed at Tyburn. William Hogarth. Last Dying Words is a deathly depository for all things execution in the North East of England. Having recently received a scholarship from Sunderland University to undertake PhD research on the last dying words of the executed in the North East of England between 1750-1880, I wanted to share what I found. Public execution is a subject that has always fascinated me and one that I am immensely grateful for the opportunity to study. I was lucky enough to be taught by Professor Robert Shoemaker at Sheffield University, during my time working at a History and Politics BA, and it was his research, books and passion for all things criminal in the 18th Century that ignited my passion for the subject. His work with Professor Tim Hitchcock on making, amongst other things, the proceedings of the Old Bailey from 1674-1913 freely available online, inspired me to want to continue that idea of sharing the information that I found. In the grand scheme of things I would love to create a resource on the nature of executions in the North East, the social make up of the executed and a repository for their last dying speeches, but for now, I have chosen to create this blog as a forum for my research, interesting topics I find and general thoughts along the way. I want this blog to be a useful and interesting resource to people like myself who have a keen interest in the subject, but little access to it. I also wanted it to be pithy, insightful, charming, without being arrogant, and basically the blog that Woody Allen would’ve written on eighteenth century capital punishment – if he hadn’t been waylaid by making career jeopardising films (Blue Jasmine excluded). I’m sure it’s already apparent that these are mere aims, most of which these opening paragraphs have put paid to – after all you can dress a chimp in a suit, but it’ll still choose bananas over Baudelaire. I digress. Thanks for reading and I hope you find something of interest. Hello, sorry to bother you, but I wonder whether you could tell me the name of the last man hanged from Newcastle City Keep- I believe the crime to be killing someone with a knife in a County Durham pub, for the love of a member of the Bowes family. I’m afraid that this is the only information I have at present. Many thanks. In Cornwall over the holidays and away from my files. Off the top of my head I’m not sure, but will endeavour to get back to you when I’m back.